Heat-related deaths and illness are on the rise in India. With summertime highs hitting 45° Celsius in rural areas, urgent action is needed to protect vulnerable populations. Dipak Zade and Brendon Bosworth report. This article first appeared on the Adaptation at Scale in Semi-Arid Regions (ASSAR) website. With a warming world, it’s time to think seriously about heat stress, especially in rural areas. To date, most research that addresses vulnerability to heat stress has focused on urban areas. There is little evidence on how heat stress affects people living in rural communities. India is no stranger to heat. In some regions, daytime temperatures regularly hit 45° Celsius in summer. Like other parts of the world, India is warming. Between 1961 and 2010 the frequency of heat waves in the country increased by a third. And between 1992 and 2015, heat-related deaths increased from 612 to 2422. As global temperatures continue to rise, heat waves in India will likely be more intense, have longer durations, and occur more often and earlier in the year. This means heat-related deaths and illness are set to increase too. People living and working in India’s rural areas are particularly vulnerable to heat. Many do strenuous outdoor work, tending to fields or working construction jobs under the blazing sun through the hottest times of day. Heat stress can lead to heavy sweating, leg cramps, intense thirst, fatigue, disorientation and feelings of paranoia. In severe cases, people may experience hallucinations, fainting and vomiting. If heatstroke kicks in, and people don’t get treatment, they can die. Heat stress is common for those living and working in India’s Yavatmal district, in the Vidarbha region of eastern Maharashtra. The region experiences high summer temperatures of up to 45° Celsius in the peak of summer. Just over 78 percent of the district’s population lives in rural areas and close to 80 percent are involved with agricultural and other outdoor manual labour. At the Rural Hospital and Training Centre in Ralegaon, Yavatmal, up to 30 percent of patients admitted to the outpatient department daily fall sick due to heat, according to Dr. Gangadhar Atram, who is based at the hospital. Those with sunstroke and sunburn require emergency treatment and are placed in a special cold ward. The short documentary, ‘Under the blazing sun’ delves into the issue of heat stress in India’s Yavatmal District. A core issue is that poor people in rural areas can’t afford to build their homes out of heat-resistant materials. Most people in Yavatmal district live in tin-roof houses. In summer, it can be hotter inside tin-roofed homes than outdoors. In the summer of 2016, some homes reached a sweltering 48° Celsius inside, according to researchers with the Watershed Organisation Trust (WOTR). People who work outdoors as farmers or labourers, mainly men in this case, are at particular risk of heat stress. This includes people who work for the Mahatma Gandhi National Rural Employment Guarantee Scheme (MGNREGS), a government employment scheme that provides assured work to rural poor for a set minimum number of days. Those doing these jobs engage in public works related to water conservation, drought proofing, and land development, among other things. They work outdoors in the sun. A few decades ago, agricultural activity in India was low during the hottest summer months. But today, the increased intensity of agriculture and working hours that see farmers and labourers working throughout the hottest part of the day combine to put workers at risk. In the Jalna district of Maharashtra, which is not typically a heat stress prone area, people have started experiencing the impacts of increasing temperatures. Researchers with ASSAR found that people in Jalna reported experiencing heat-related symptoms. These ranged from mild — like small blisters, fatigue, leg cramps, heavy sweating, intense thirst, rapid heartbeat, and headaches — to severe symptoms including hallucinations, fainting and vomiting. The ill and elderly are particularly susceptible to heat stress in rural areas, especially if living in tin-roof homes with no ventilation. Women are also at risk when doing things like cooking on wood-burning stoves, fetching drinking water, and collecting firewood. 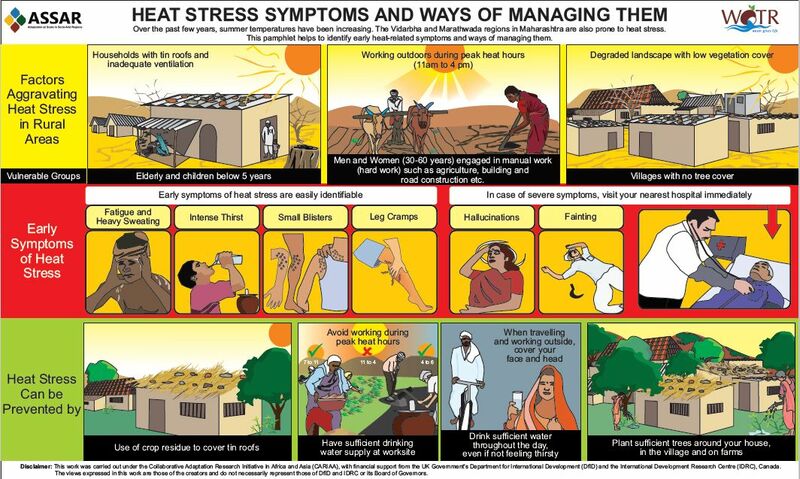 Heat stress management poster produced by WOTR. (Download). As global temperatures continue to rise, urgent measures are needed to curb exposure to heat stress — in India and elsewhere. Governments need to develop and implement state- and local-level heat action plans, with a particular focus on rural populations. In India, this will require greater coordination between government institutions such as the Departments of Rural Development, Health, and Agriculture, and the National Disaster Management Authority. In places like Yavatmal, strategies to keep people cool could include promoting the use of layers of crop offcuts on tin roofs, and building community halls for people to rest in during the hottest time of day in summer. It will be important to focus on improving housing designs using low-cost measures, such as better ventilation, and using tiles instead of tin for roofs. Coolers can also be used to lower indoor temperatures but people need water, electricity and funds to buy them. The timing of MGNREGS work and other outdoor, labour-intensive work could be adjusted during summer so workers don’t labour through the hottest time of day. Drinking water could be provided at work sites. There is an urgent need for pre-emptive strategies to ensure that people in areas where heat waves are not yet a phenomenon are supported to reduce their vulnerability. Community awareness about heat stress should also be improved so that people can take adequate precautionary measures. With the intensity and duration of heat waves projected to rise along with climate change, action is needed to better understand heat stress and protect at-risk populations. More of ASSAR’s research about heat stress in India is available at the links below. Vulnerability to heat stress: A case study of Yavatmal, Maharashtra, India. (Policy brief). Heat stress – vulnerability, health impacts, and coping strategies in rural communities in the semi-arid region of Maharashtra, India (Working paper). Health vulnerability to heat stress in rural communities of the semi-arid regions of Maharashtra, India (Policy brief). Under the blazing sun (Film). Heat stress symptoms and ways of managing them (Poster: English), (Poster: Marathi). Heat stress management pamphlet (English, Hindi, Telugu, Marathi). Managing the increasing heat stress in rural areas. Book chapter in the Handbook of Climate Change Resilience (2018). Springer. Dipak Zade is a researcher in the Watershed Organisation Trust’s Centre for Resilience Studies (W-CReS), based in Pune, India. He is part of the Adaptation at Scale in Semi-Arid Regions (ASSAR) project. Brendon Bosworth is a communications officer with the Adaptation at Scale in Semi-Arid Regions (ASSAR) project. He is based in Cape Town, South Africa. This work was carried out under the Adaptation at Scale in Semi-Arid Regions project (ASSAR). ASSAR is one of four research programs funded under the Collaborative Adaptation Research Initiative in Africa and Asia (CARIAA), with financial support from the U.K. Government’s Department for International Development (DfID) and the International Development Research Centre (IDRC), Canada. The views expressed in this work are those of the authors and do not necessarily represent those of DfID and IDRC or its Board of Governors.